Dr. Todd Eric Driggers grew up in a rural Indiana town where loving animals and providing medical care for them became his passion. He started by caring for his pet dogs and cats as a boy and progressed to exotic pets such as a pet turtle named Tippy. Dr. Driggers was admitted to the Purdue University School of Veterinary Medicine after just two years of undergraduate studies at Purdue due to his obvious commitment to the profession, demonstrated by his volunteerism and job at a small animal hospital in Indiana. Science, biology and eventually medicine have been combined in his career as a practitioner of exotic animal medicine and surgery. 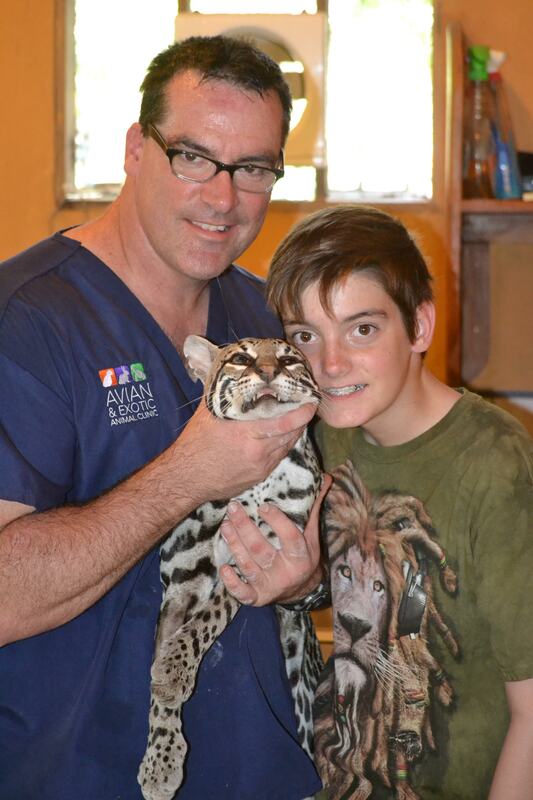 After graduating he began working exclusively with exotic animals at the Avian and Exotic Animal Clinic in Indianapolis and eventually moved to Arizona where he started an exotic practice at Mesa Veterinary Hospital. He started a mobile practice “Foothills Mobile Exotic DVM” in 1997 and changed the hospital name to the “Avian and Exotic Animal Clinic of Arizona”. He has spoken nationally and internationally at the Association of Avian Veterinary Conferences, Association of Reptilian and Amphibian Veterinary Conferences and the Association of Exotic Mammal Veterinary Conferences and written several chapters in various peer reviewed journals and books. Dr. Driggers vacations in places where he can view and learn about the wildlife that he treats at the office. Dr. Driggers is involved in many extra-job activities including his work as the medical coordinator for medical mission trips to the Dominican Republic through Food for the Hungry. He is president of The Oasis Sanctuary board and is the staff veterinarian. Additionally, he is on the social media committee for the Association of Avian Veterinarians. Dr. Driggers is a busy father of three and husband to his high school girlfriend, Heather.